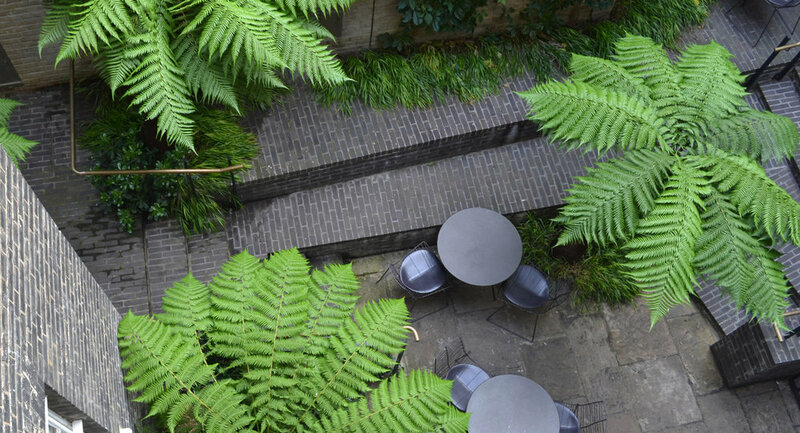 This small courtyard garden by Tom Stuart-Smith Ltd forms part of the Keepers House bar at the Royal Academy of Arts, just off Piccadilly in London. Surrounded by tall buildings it provided a challenge due its limited space, level changes and low light conditions. Brick was used to reflect the surrounding buildings and a series of steps and retaining walls created a landscape which can be inhabited and utilised in a number of ways. A limited pallet of plants was used with the most prominent being the Australian tree ferns. These dramatically populate the space, create a comforting green canopy and thrive without direct sunlight. This project was designed with Tom Stuart-Smith Ltd when Jem was an Associate there. Jem lead the competition winning team. The construction was overseen by his former colleague Andy Hamilton.